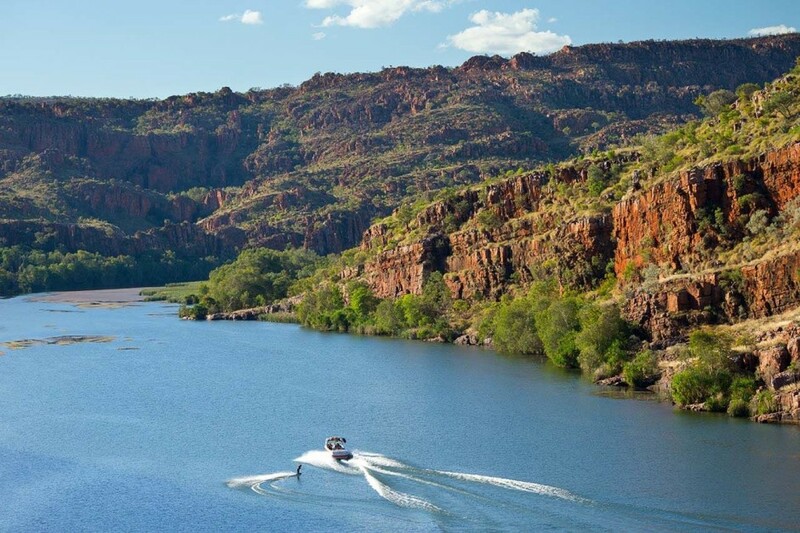 Remote and sparsely populated, The Kimberley, covering almost 423,000-square kilometres, is larger than 75% of the world’s countries yet ranks amongst the least-settled places on earth. Accounting for the majority of northwestern Australia, The Kimberley consists of vast plains dotted with boabs, punctuated with mountains containing palm-fringed gorges and spectacular waterfalls, surrounded by deserts to the south and east, and ultimately the treacherous coastline to the north and west. 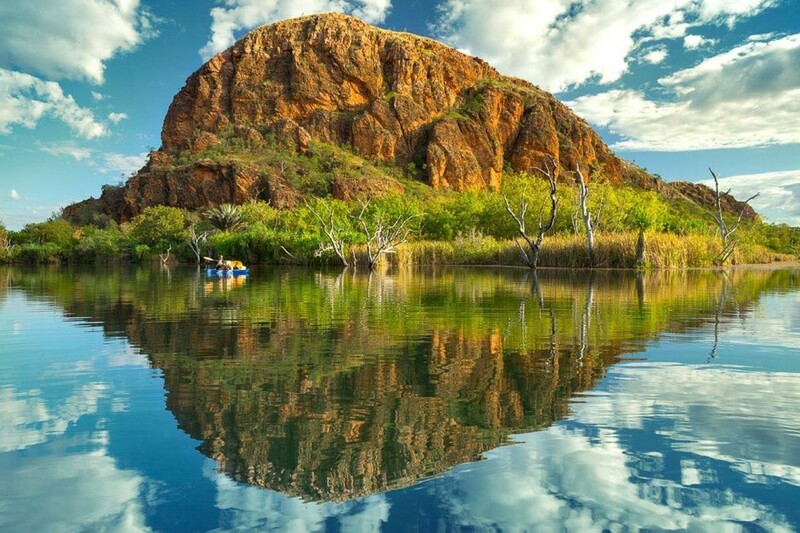 Traveling here is a true adventure — each dry season (May-September) a steady flow of people comes to explore what many consider to be Australia’s last true frontier. 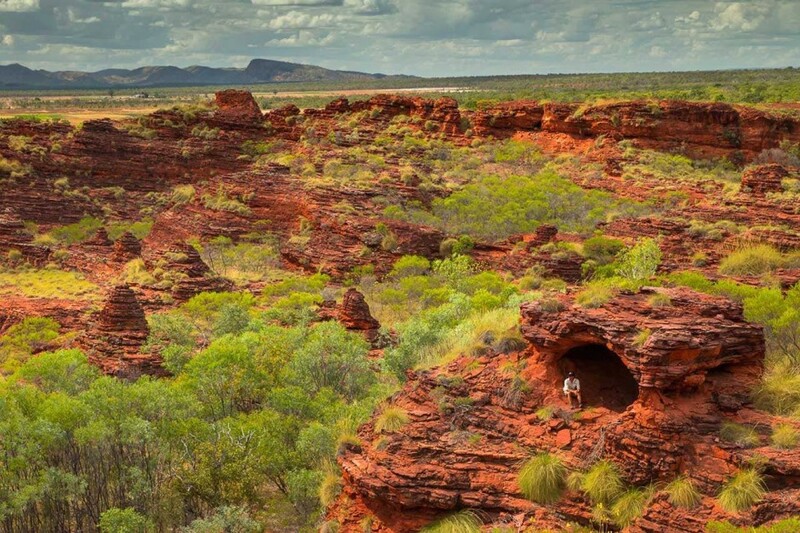 Aboriginal culture runs deep across the region, from the Dampier Peninsula — where coastal communities welcome travellers — to the distant Mitchell Plateau — where Wandjina and Gwion Gwion art stand vigil over sacred waterholes. Interestingly, one of the universal truths of remote travel is that despite searching for secluded solace it’s always the people that make the difference. This is true of the Kimberley and those people were primarily, brother and sister, Scotty and Melissa Connel. Both children of The Kimberley, they have a warmth resilience and a gentle, intimate understanding for the beautiful, often harsh environment. They were to be my guides and it soon became clear I could not have landed in more capable and knowledgeable hands. 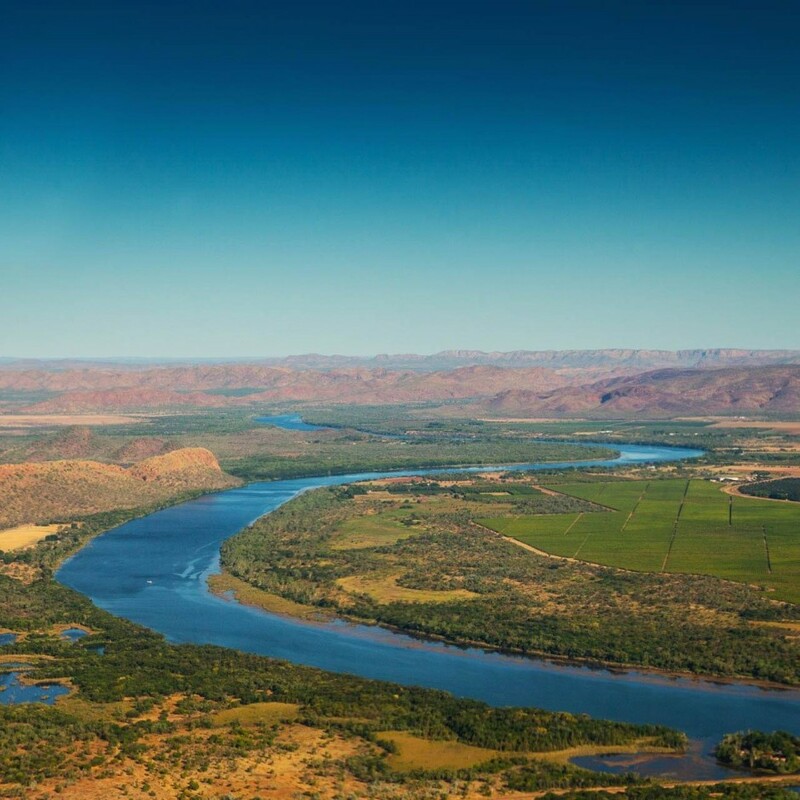 What follows is the first of two pieces, characterised by the mode of transport — firstly some of the inner Kimberley, by 4×4, kayak, and on foot; and second, some of the endless coast, accessible only by boat and the interior from the air, photographed from plane and helicopter. 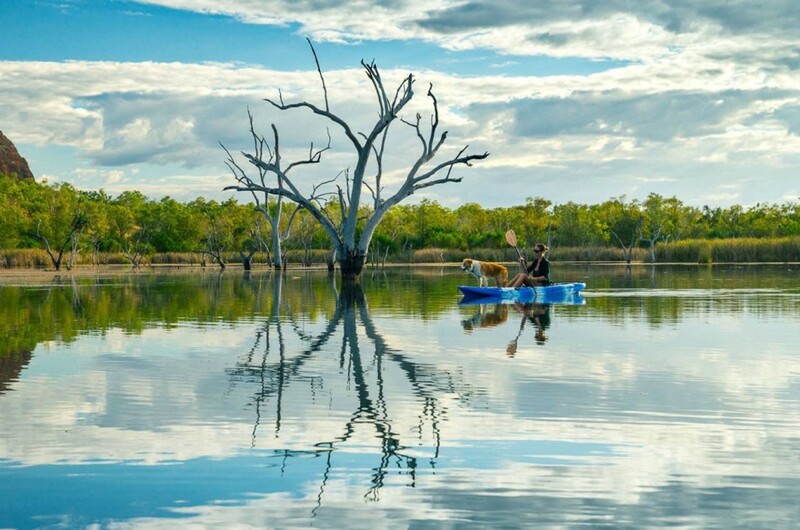 Scotty would be regarded as one of the top - if not the top guide - in The Kimberley region. 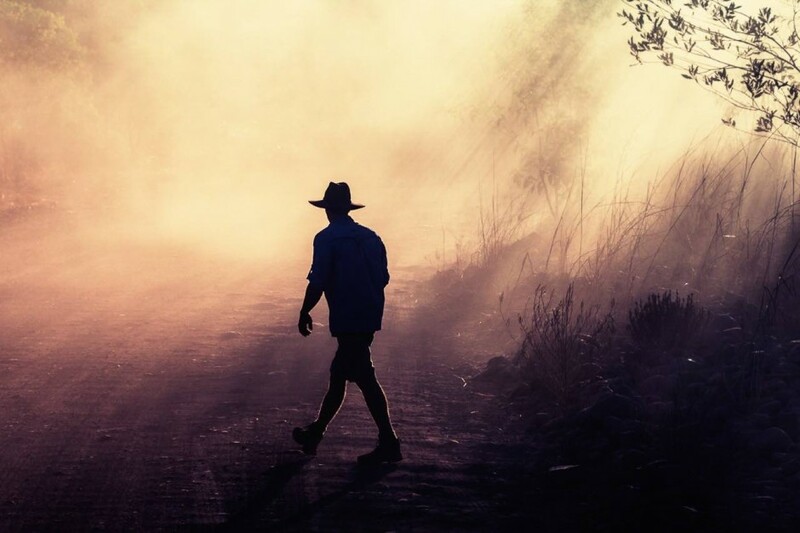 Once the apprentice, now the master, if you get the chance to meet him, be sure to ask about the deadly snake bite in remote bush, whilst out with his mentor… Picture a softly spoken, young, athletic version of Mick Dundee (even the beautiful, intelligent blonde girlfriend). However, this is no Paul Hogan acting the bushman, Scotty is the real deal. Understated, he wasn’t a particular fan of pictures (and would cringe at these compliments! ), but I managed to capture this moment in the swirling dust of a passing truck on The Gibb River Road. 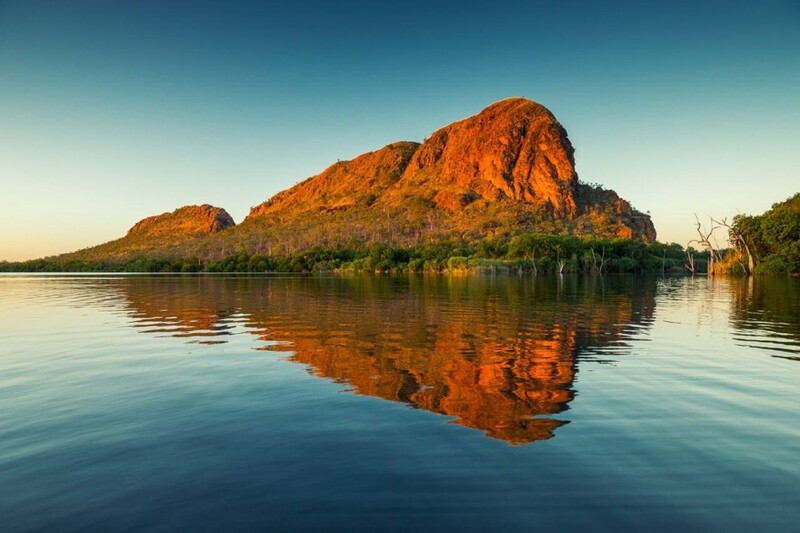 Affectionately known as ‘The Gibb,' this legendary, mostly unpaved road stretches for approximately 410 miles (660 km), from Derby on The Kimberley’s west coast to Wyndham/Kununurra in the north east, approaching the border of the Northern Territory. 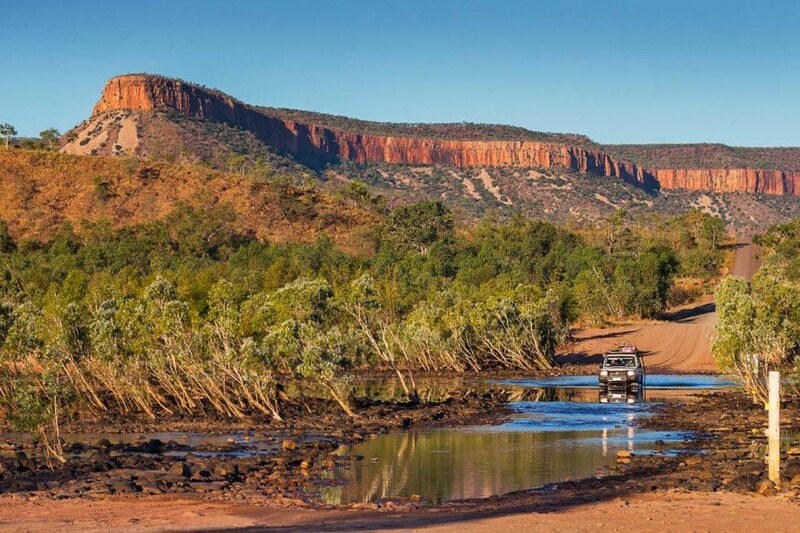 The iconic Pentecost River crossing, with the backdrop of the Cockburn Range can’t fail to impress even the most seasoned traveller. The sandstone escarpment of the Cockburn range reaches 600m above the surrounding landscape. 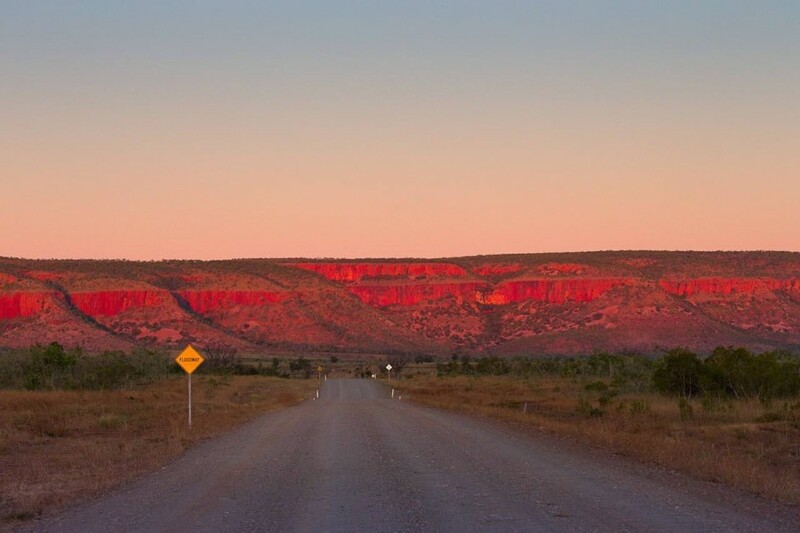 The south-western ridge presides over the final sections of The Gibb approaching Wyndham and Kununurra and is best seen glowing red at sunset. I had often seen pictures of the Madagascan and African baobabs, particularly the avenue in Madagascar, but little did I know they could be found outside Africa. 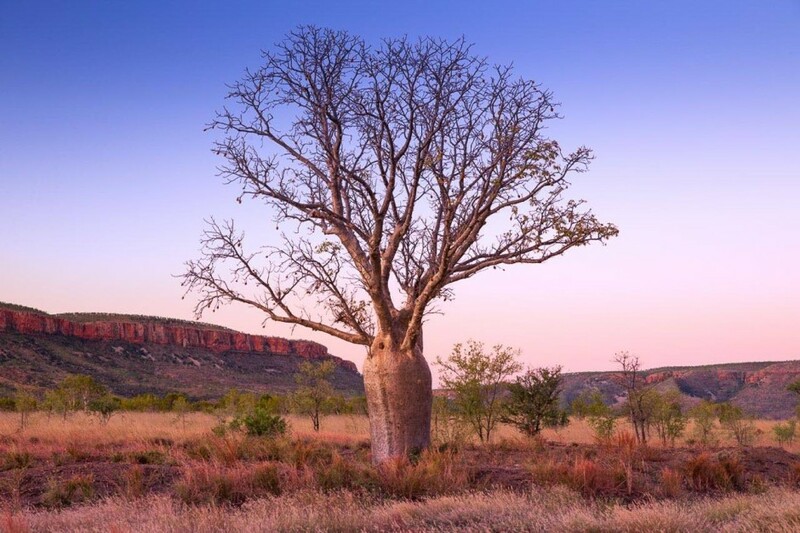 The Australian boabab tree (Adansonia gregorii) is a cousin of the African trees and is known simply as the ‘boab.’ There can be few species with more character, but with some individual trees reaching 1500 years old, it’s little surprise they accrue such personality. 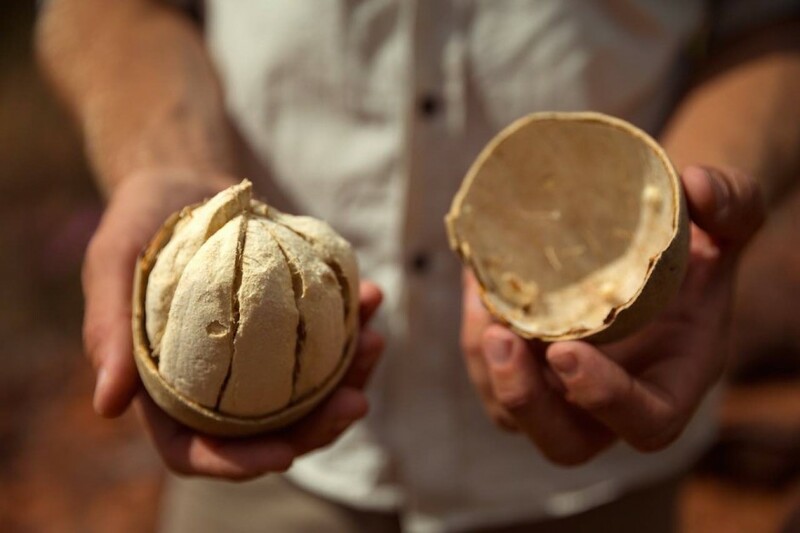 Locating and making the most of ‘Bush tucker’ - essentially food from the Australian wilderness - was essential to Aboriginal life. Boabs were used by indigenous peoples, not just for shelter, but also as a source of food and medicine. The roots are reputed to be delicious and the round nuts - seen dangling from the branches akin to Christmas tree baubles - are loaded with Vitamin C. The white pithy segments (see above) aren’t exactly delicious or entirely nutritious, but would be important in maintaining health in such a remote environment. 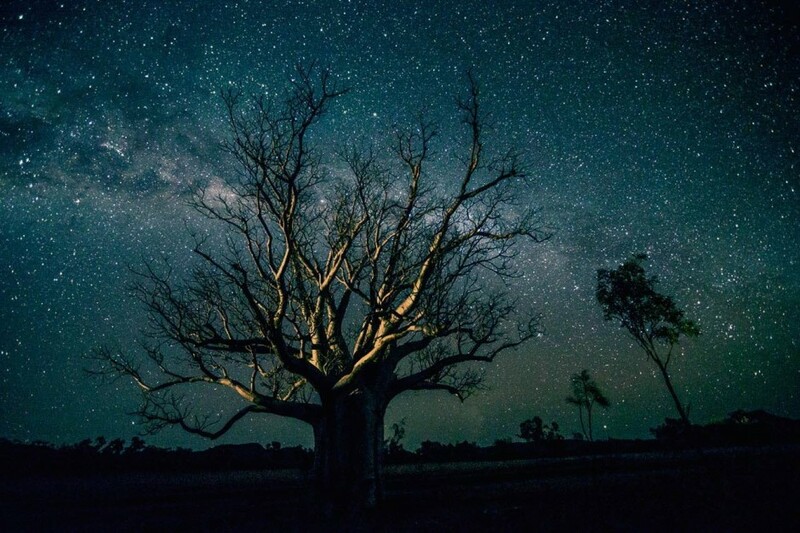 Away from settlements, there is very little ambient light at night in The Kimberley; it’s no exaggeration to say the stars illuminate the firmament – and I couldn’t resist getting a boab in the shot! ‘Kunners’, as it is affectionately known locally, is the largest town north of Broome in the State of Western Australia. 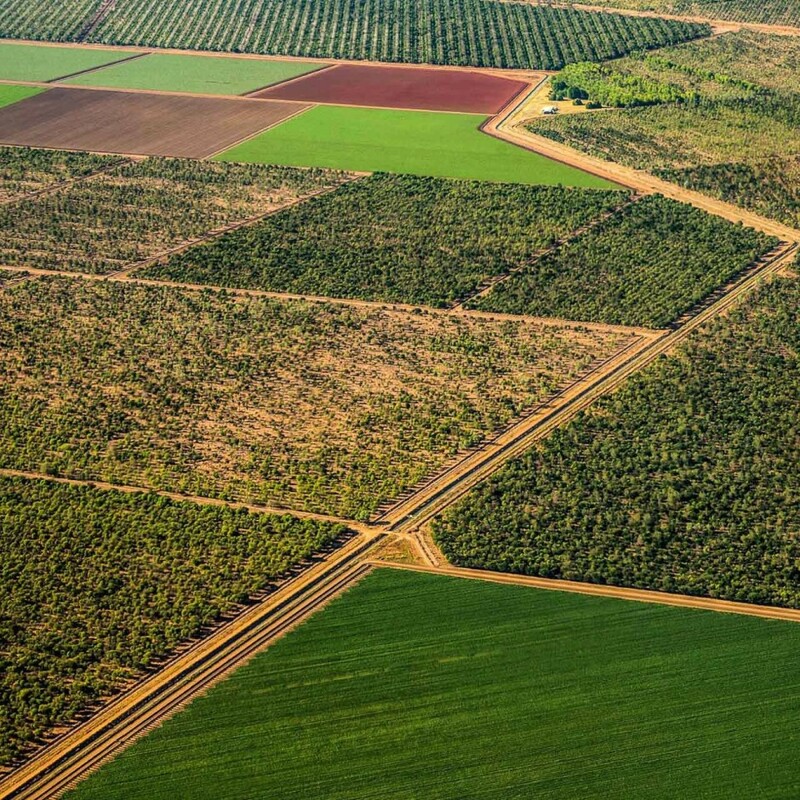 A patchwork of greens, interwoven with irrigation channels, clustered around the Ord River gives a clue to what fuels the local economy: mangoes, melons and traditionally sugar cane, which has now been largely replaced by the incredibly lucrative production of Indian Sandalwood (Santalum album) are among the sixty or so crops. 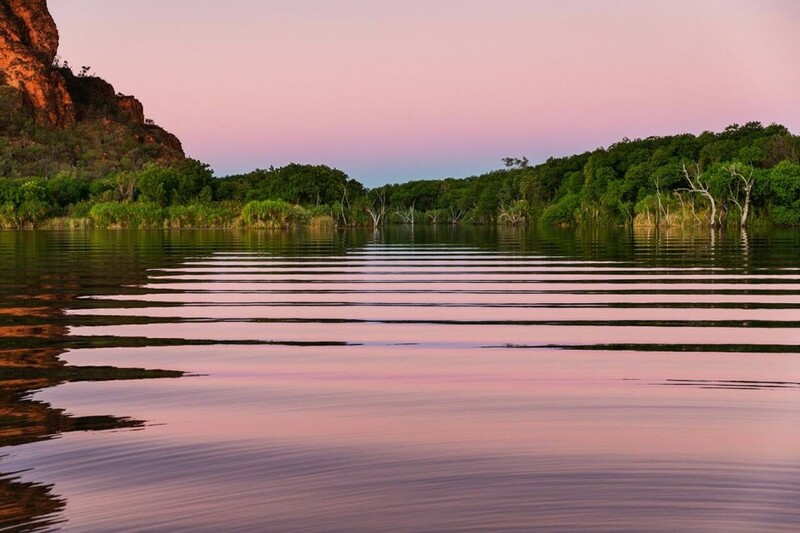 This agriculture was made possible by the construction of dams across the Ord River; one is just outside town and has the advantage of not only allowing consistent irrigation, but also splits the river into the ‘lower Ord’, with salt water crocodiles or ‘salties’ (making it unsuitable for watersports, if you value life and limb) and the ‘upper Ord’ where there were no salties and recreation. Wakeboarding, swimming, fishing and so on are quite common. Instantly recognisable, Carlton Ridge, as it’s officially known, is a landmark on the upper Ord. Standing not far from town Elephant Rock is a visual delight at sunset. The canoe/kayak allows access to areas to see things like these lovely turtles painted by aboriginals in difficult to access landscape. Hanging on the front of Melissa Connel’s kayak is one of Sandy dog’s favourite pastimes. 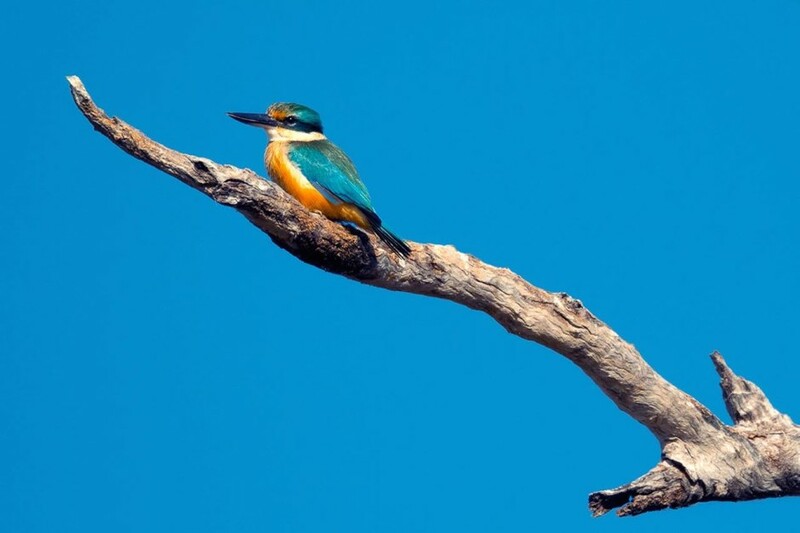 A kayak is the ideal vehicle for observing birdlife on the river, no engine, no mechanical sound and one can stop paddling and drift towards the wary creatures in total silence. 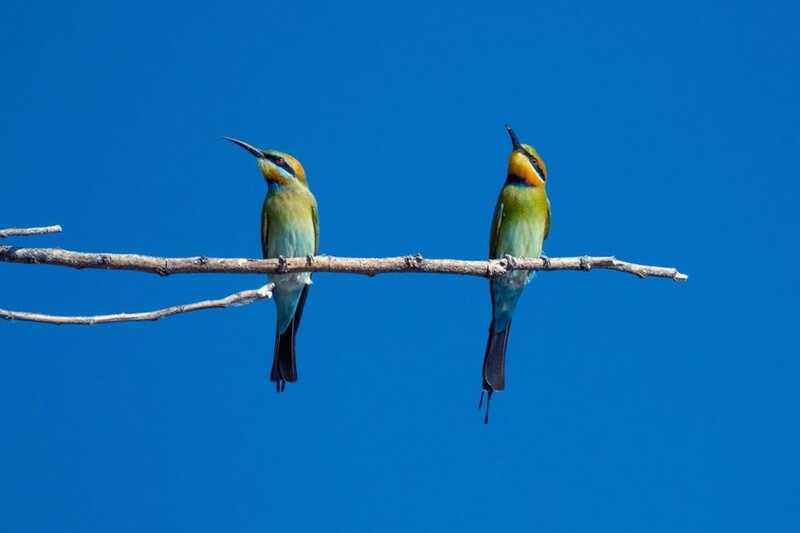 Bee eaters dart around, before beating the sting out of their catch back on a branch, pelicans observe passers by peacefully from a suitable perch, and silent flashes of technicoloured brilliance herald a kingfisher. 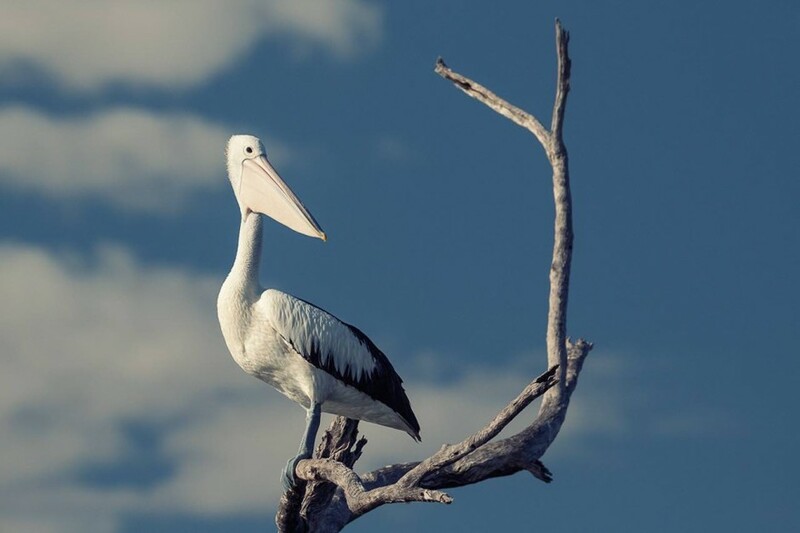 Seldom seen by day, ‘freshies’ are extremely stealthy, perhaps moreso than the saltwater croc - and that’s saying something. 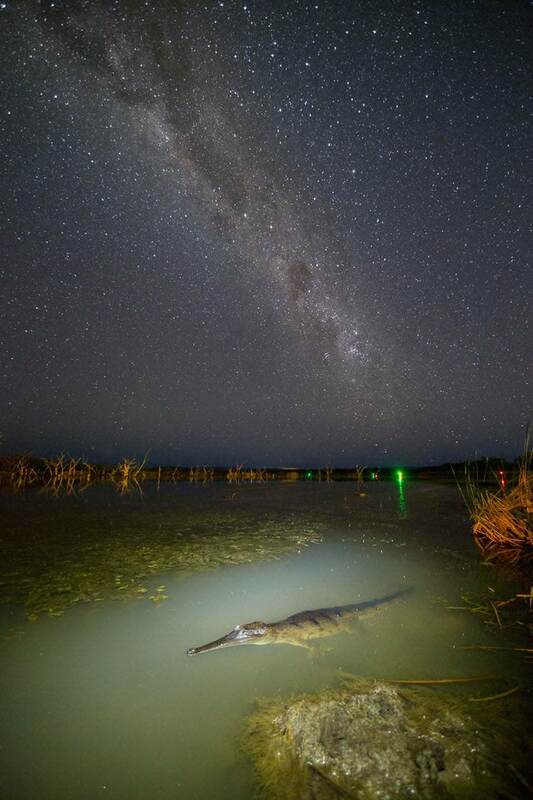 Nightfall brings a change, crocs move from their daytime cover; here a flashlight shows a prehistoric hunter lying in wait under the Milky Way. I can think of few places where the backdrop to wakeboarding could be more spectacular and generally, with light winds, the surface conditions on the upper Ord are ideal. 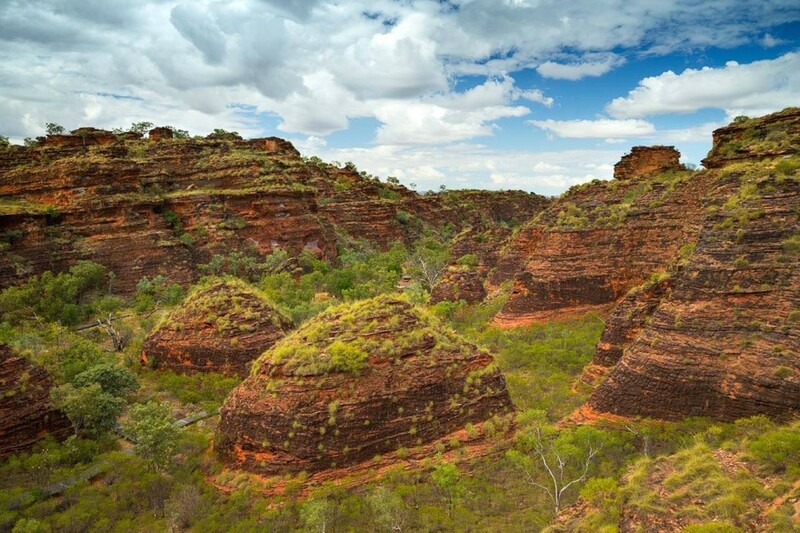 The fascinating rock formations found in ‘Hidden Valley’, just outside Kunners, resemble those of the ‘Bungle Bungle Range’ in the World Heritage Purnululu National Park 300 km south of Kununurra, but aren’t as massive, hence the ‘mini’ moniker. 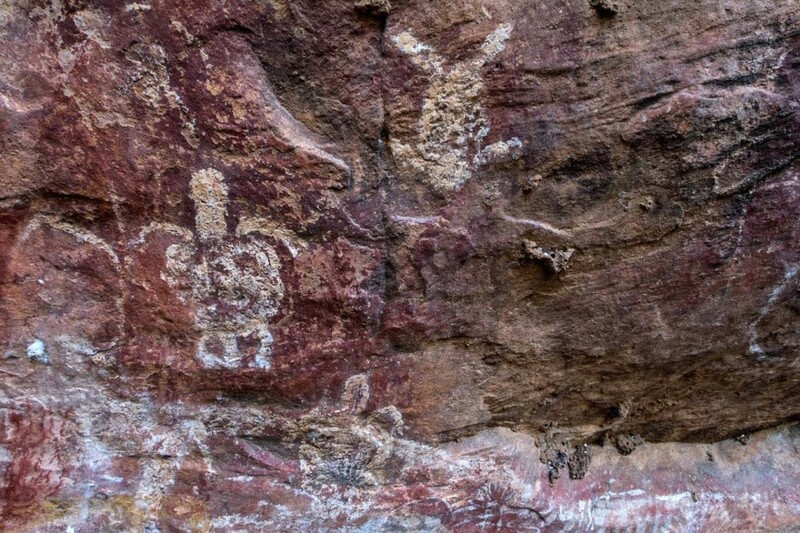 After some bush whacking and a short stroll over exposed sandstone, Scotty revealed a location known to few: two caves used historically by the Miriwoong people. In seeing the art on the walls and furrows, worn from years of sharpening tools on ledges, there was a sense of seeing something rather special, of being privileged to have a window in on that ancient way of life. Standing in the mouth of the cave, elevated above the infinite landscape, the breeze rustling through the trees, one couldn’t help feel the indigenous tribes had it right. 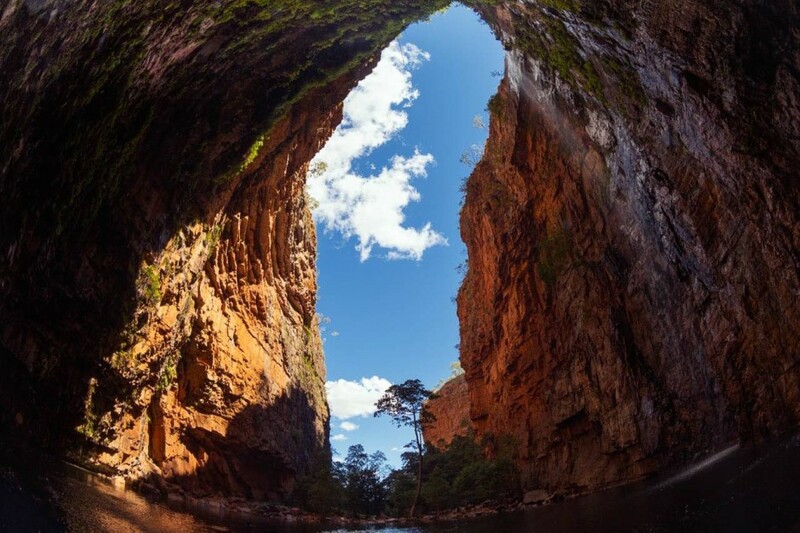 This cavernous gorge is located in the privately owned El Questro Wilderness Park, which covers approximately one million acres, lying 110 kilometres west of Kununurra. This view is looking back out of the gorge. After a walk, picking one's way over boulders and streams, the head of the gorge and swimming hole is reached, a welcome sight, particularly after the heat of the midday sun. 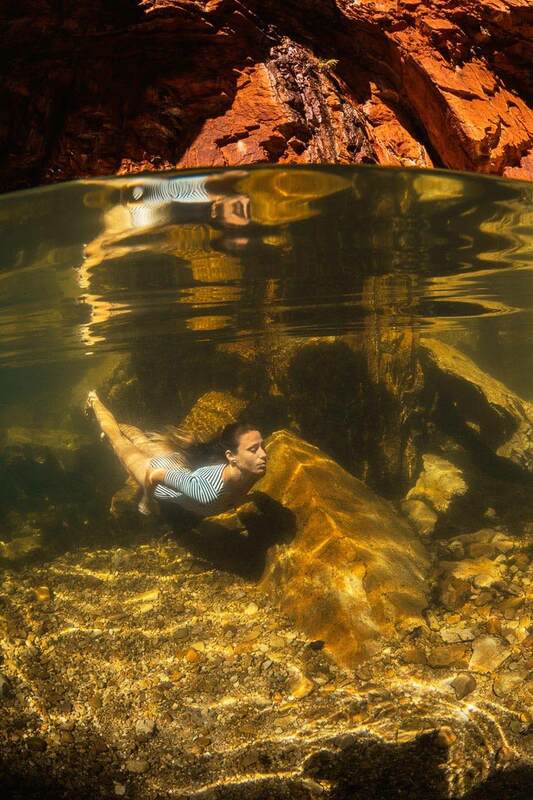 Here Liss Connel is seen diving into the crystalline waters. 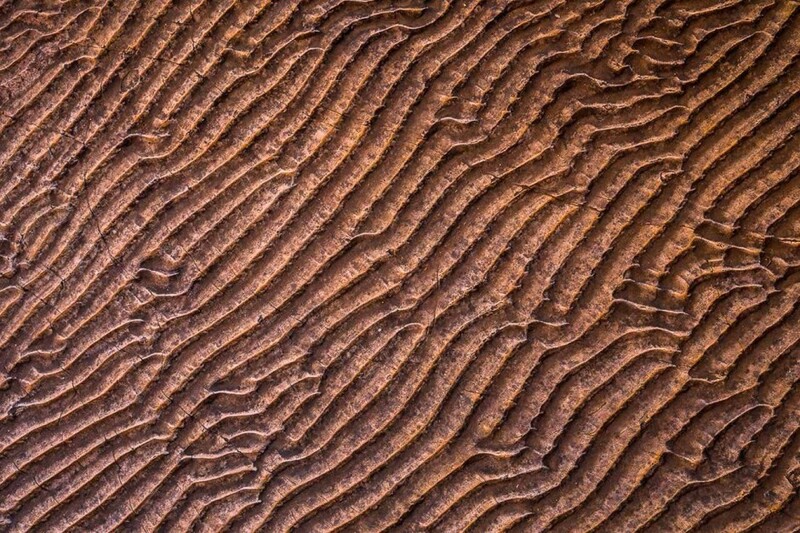 One of the things that struck me about The Kimberley were the beautiful patterns, from the minute to the grand. Sometimes it was the little, in this case below ones feet, that stuck in the mind, particularly this rock, which reminded me of patterns left on a sandy beach by the receding tide. I’d seen outdoor cinemas in the movies and it would be fair to say a lifelong ambition was – rather unexpectedly – achieved during my time in the Kimberley. 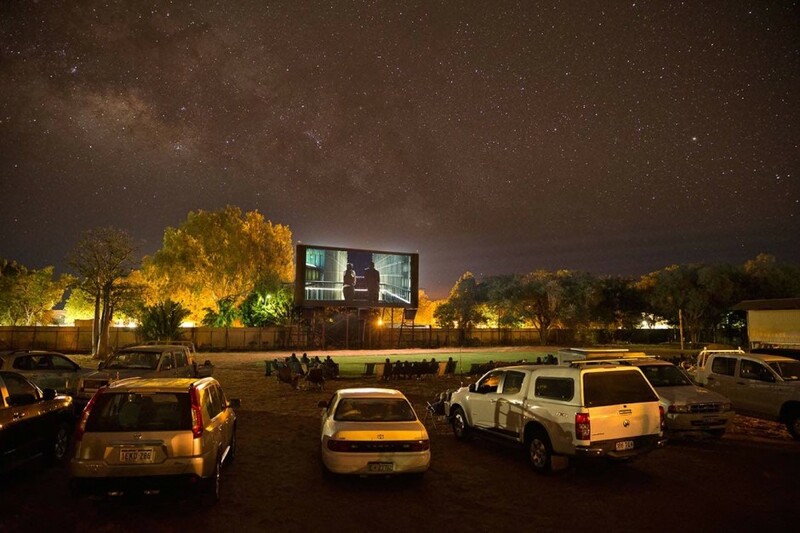 Watching a movie at the Kununurra Picture Gardens whilst lying on blankets in the back of a Toyota Landcruiser, in the balmy night air, is something everyone should do once in their lives. Although, truth be told, on this occasion, it might’ve been the Kimberley stars - not the film's stars - that stole the show.